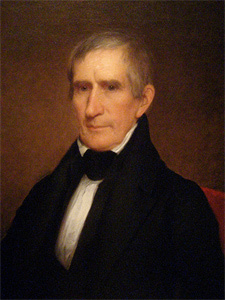 William Henry Harrison, the ninth president, was born at Berkeley Plantation in Virginia on February 9, 1773. His father, Benjamin, was a member of the Continental Congress and a signer of the Declaration of Independence. The young Harrison grew up on the James River just 30 miles from Yorktown, where Cornwallis surrendered to Washington. William, the youngest of seven children, learned to rely on himself early in life. The Christmas season was celebrated on Virginia plantations by attending church services and decorating their homes with holly and ivy. William, no doubt, followed the colonial boy’s custom of “shooting in the Christmas,” which consisted of firing their guns into the air on Christmas Eve morning. William took his studies seriously at Hampden-Sydney College in Virginia for three years before moving to Philadelphia to study medicine with the renowned physician, Bernard Rush. William’s father died in 1891, leaving him virtually impoverished and unable to continue his studies. At the age of 18, having inherited nothing from his father, William entered the army as an ensign, gathering up a group of about 80 roustabouts in Philadelphia and went to Fort Washington in the Northwest Territories, which consists of present-day Ohio and parts of Indiana and Illinois. He served under “Mad Anthony Wayne” and was promoted to Lieutenant in 1792. Life on the frontier was primitive and so the Christmas celebrations would have been kept to a minimum and most likely accompanied by a Christian service. William’s mother died in 1793 and he inherited some 3,000 acres and several slaves. Having made the army his career and distinguishing himself to his superiors, William felt that he would be better served selling his inheritance to his brother. There is no information whether William ever returned to the family plantation for Christmas celebrations or for any other occasions. Very little private family information is known of William Henry Harrison. Having met and fallen for Anna Tuthill Symmes in 1795, William asked her father, the prominent Judge John Cleves Symmes, for her hand and her father refused. This did not stop William, who waited until Judge Symmes was away on business and then eloped with her on November 25, 1795, just one month before Christmas. The newlyweds purchased 160 acres of land in North Bend from the judge who was concerned about Harrison’s prospects. 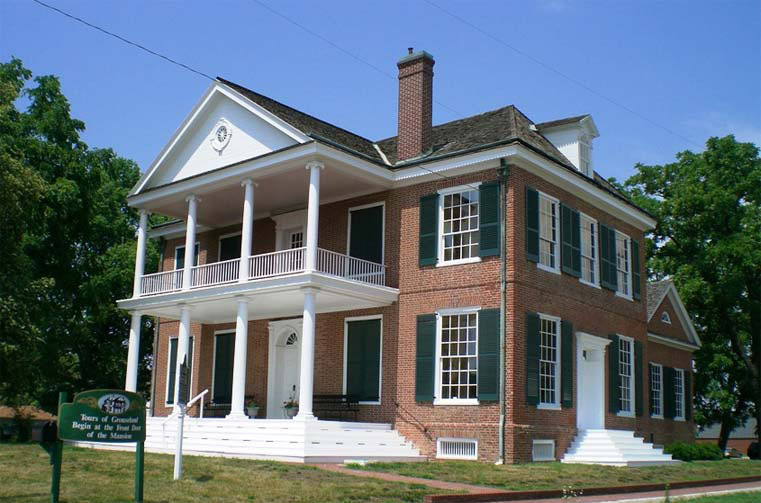 William Henry Harrison built his Grouseland estate, located in present day Vincennes, Indiana, while he was governing the Northwest Territory. Here is where he would spend many Christmas holidays with his large family before his short stint in the White House. Surely the Harrisons’ first Christmas together was filled with a great deal of family drama and turmoil from setting up a household on the frontier. William was promoted to captain and after Wayne died in 1795, he took command of Fort Washington. Feeling that the army career was not promising enough, Harrison resigned from his commission in 1798. Judge Symmes, who at the time became a newly appointed Congressman, used his contacts in Washington, D.C., and President John Adams appointed Harrison to Secretary of the Northwest Territory. The following year he was elected as a delegate to the United States Congress, where he was able to get land-buying policies changed to allow settlers to buy smaller plots of land on four-year installments. 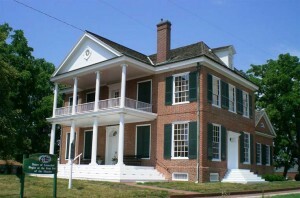 Harrison and his wife, Anna, built a home and had a successful horse breeding venture as he continued his political rise. They were blessed with ten children between 1796 and 1814. Anna was often not well due to the repeated pregnancies, and their last child, James, lived only three years. Still, Christmas celebrations would have been lively with children of various ages singing, playing, and perhaps enjoying some treats. They may have picked up the habit of having a Christmas tree from the Dutch and German immigrants who were settling the Northwest Territory. Their son, John Scott, later became the father of Benjamin Harrison, who would become the 22nd president. The 2006 White House Christmas cards depicted President Benjamin Harrison’s White House Christmas tree with the years 1889-1893 written beneath the picture. Harrison spent the years leading up to the War of 1812 as governor of the Northwest Territory. He would have spent many Christmases in “Grouseland,” the home he built in Indiana. Christmas in the early 1800s was celebrated from Christmas Eve until January 6th. He managed to negotiate many land deals between the United States and the Indian tribes, but one Indian chief, Tecumseh, opposed Harrison’s deals and this came to head at the Battle of Tippecanoe. Winning this battle made Harrison a folk hero which later aided him in his run for the presidency. The War of 1812 started in the summer of that year, and Harrison was appointed major general with command of all the Northwest forces. At the age of 41, Harrison resigned from the army, although the war was not over. This did not help his political career, and over the next 25 years he continued to week election from one office to another. Harrison was successful in being elected to the House of Representatives in 1816 and served until 1819. After returning to Ohio, he was elected to the state senate. He was unsuccessful in running for governor in 1820 and for the U.S. House of Representatives in 1822, but he finally won a U.S. Senate bid in 1824 and was briefly an ambassador to Columbia. Harrison lived above his means and was often in debt. This may be the reason he was constantly seeking higher paying political appointments that many people resented. During the years between 1817 and 1840 he saw six of his ten children die. The remaining four children would see their father take up residence in the White House as the ninth president. I never knew we had a president for such a short amount of time. That’s very interesting…I wonder how easily he would have been cured with today’s modern medicine. Very interesting. Never knew this much about this particualr president. Had to google franking – had no idea what it meant.